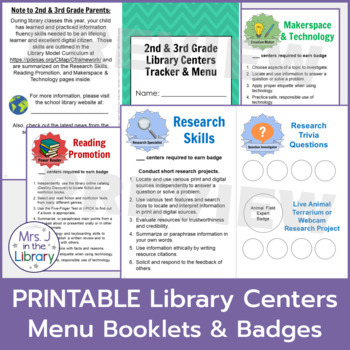 Track and manage student learning at library centers with these PRINTABLE tracking booklets and learning badges for students to earn as they practice and/or master an information literacy skill! 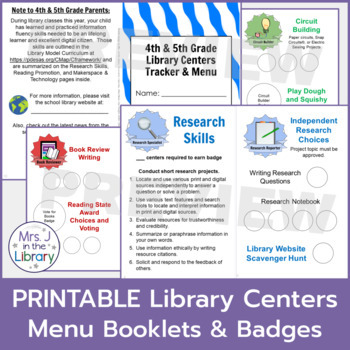 During each library class, students earn a "stamp" in their booklet when they choose a library center. Additionally, if a section or project is completed, then students receive a larger badge sticker to show their learning. DOWNLOAD THE PREVIEW and get a FREE teacher checklist for easy center tracking and data collection. 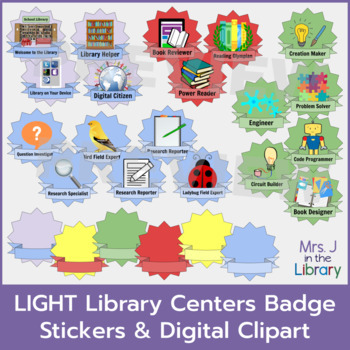 You can also purchase the badges clipart and stickers separately if you already have your own center management system. All booklets are editable in Microsoft Publisher, and the blank version is also available in easy-to-print PDF file format. ◉ FREE teacher checklist in the preview to track which centers students are visiting and make sure students aren't visiting the same center over and over. To remind students of behavior expectations and acclimate new students to the library centers model. Expectations are on page 1 of each booklet. To visually show students what they are learning and have learned throughout the school year. 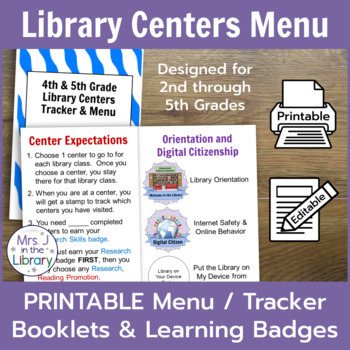 To record each student's center choice each week when used in conjunction with a checklist in Google Sheet or Excel spreadsheet (available FREE in the preview). This data can show you and administrators if students are visiting the same center over and over or exploring new learning experiences. The spreadsheet checklist can also help you assess students' learning and make sure that each student gets the same learning opportunities. To communicate and advocate the library curriculum and program to parents. Each of the 3 learning sections, or modules, explains what skills students have learned, and the back page can link to your library website and/or social media. ​Still have questions? ​If the free preview file does not answer your question, you can contact me through the Q & A section on TpT with any questions or requests. You can also send me an email at MrsJ@mrsjinthelibrary.com.